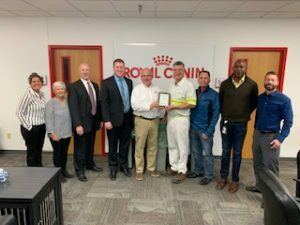 The North Sioux City Economic Development Corporation presented its November Business of the Month recognition to Royal Canin. Royal Canin is a global leader in pet food manufacturing that is in the process of finalizing their $100+ million dollar expansion in North Sioux City. To learn more, visit Royal Canin’s website at https://www.royalcanin.com/. Royal Canin is located at 630 N. Derby Lane, North Sioux City, SD 57049.